Seasoned sponsors from various Twelve Step programs offer wisdom and stories to support you in recovery. Seasoned sponsors from various Twelve Step programs offer wisdom and stories to support you in recovery.Anyone working the Twelve Steps knows the importance of a good sponsor. What if you could have the collective wisdom of numerous sponsors of all ages, genders, and cultural and social backgrounds available to you at any time on critical recovery issues? This book collects 100 short stories on issues such as working the Steps, dry drunks, clean and sober relationships, cravings, and more, told by those who learned how to cope with each challenge by using a lesson from their own sponsor. The lessons are universal, but come from the philosophies of AA, NA, OA, SAA, and more. 5.0 颗星，最多 5 颗星Awesome meditational sharing real life recovery wisdom. Recovery has a strong oral tradition of sharing wisdom gained through experience, which is at the heart of healthy meetings and healthy, supportive sponsor relationships. 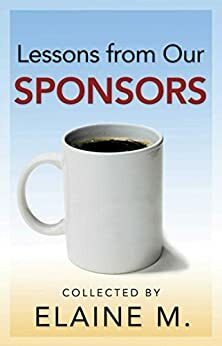 I am blessed to hear of what other sponsors have to say in this friendly, welcoming book. In reading vignettes of a page or three in length, I hear the wisdom, encouragement, and hope of dozens of people that Elaine was able to interview. I qualify for only one recovery program, but the message is universal as our common goal is to move away from the destructive behavior that comes from the addiction of our choice and move into a better way of living. The stories that people share about wisdom they gained from their sponsors comes off as gentle, caring, and non-preachy. Thank you to all the people who shared their recovery and thank you Elaine for bringing this book to us. I use the many stories in this book when I work with my addiction patients. We have AA/NA meetings at our facility every Wednesday night. This book is a perfect adjunct to those more formal meetings, if you can call an AA meeting in any way "formal". The stories come from the hearts of many people who hit bottom, and managed to beat their addiction. Of course, people cannot be forced to change their ways. But when a person is ready and receptive, this book offers much food for thought with many motivational messages.